Are you in Scottsdale or Phoenix and considering a Jeep tour? ATV Tour or Jeep Tour? Oakley says one of our Desert ATV Tours! Definitely!! When you visit the Sonoran Desert, do not limit your freedom to the main roads. If you stick with pavement-tour, you will miss out on the true nature of the desert. Imagine the grandeur, limited-access areas, wildlife, and history in the desert. Unlike Jeep Tours, we make every accommodation to NOT limit what you see. We don’t want your trip to the desert to become something you could peruse at the library; it should explode in your mind. Fortunately, Desert Wolf Tours has an excellent alternative for the run-of-the-mill things to do in Scottsdale: TomCar ATV Tours. Let’s take a look at how a TomCar Tour is the only way to really see what the desert keeps secret. Smoother Ride Than a Jeep Tour. Compared to Jeep and Hummer Tours, which Desert Wolf Tours also offers, ATV tours offer unmatched comfort for a superior, smoother ride. With a TomCar, you can embark into the desert sun without being restricted to the bumps, bangs, and bruises of a Jeep Tour. An ATV tour is much smoother than a traditional Jeep tour. TomCars have enhanced suspension systems and cannot compare to a Hummer, Jeep, or other desert touring van. If you want to see what a highway in the desert looks like, then a Jeep is fine. If you want to actually see what the desert looks like without the modern engineering feat of pavement, you need to check out how smooth a TomCar is on the open desert. 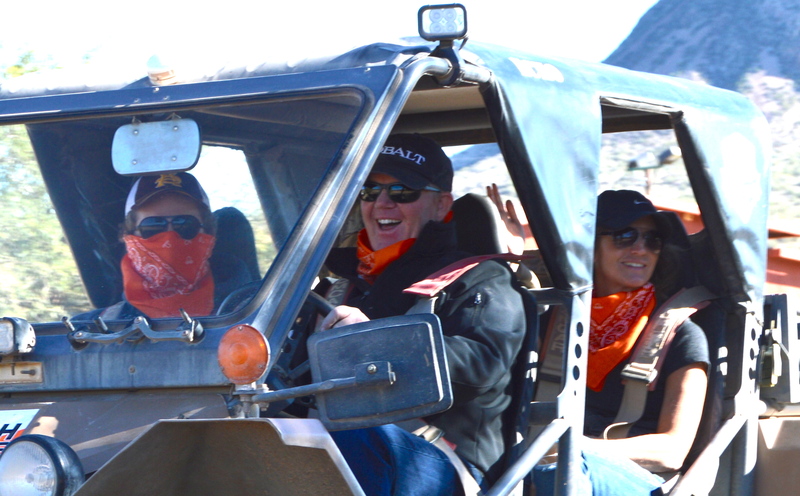 The best thing about our ATV tours is that you get to be the driver! Who wants to be stuck in a Jeep with a driver making every turn, stopping at each crossroads, and pushing the gas? Well, at Desert Wolf Tours, anyone with a valid driver’s license and over the age of 18 can drive a TomCar. These ATVs are easy-to-drive and safe. For the protection of minors, we provide DOT-approved helmets, which are now required in Arizona. If you’re over 18, the choice of wearing a helmet is entirely your own. Also, in our side-by-side atv tours, you get to experience the power of driving in the open desert, away from the confines of the road, away from the stereotypical tourist destinations, and into the land where many lived in once-thriving Indian villages and ghost towns. Go Where No Jeep Tour Has Gone Before. So, maybe a Jeep has been to some of the secret desert attractions, albeit over a jostling ride, but few can get to the hard-to-reach areas where a TomCar can go. Sneak up on the wildlife in their natural habitat, and find out what is really hiding out in the desert. You can completely avoid the tourist-hotspots, where your “natural wildlife” photo may have another tourist in the background. Since ATV rentals are aerodynamic, high-set, and extremely durable, they can practically soar above shrubs, plants, and running water, provided the water isn’t a full-on, roaring river. Pitch around the jagged boulders and Sonoran cacti without becoming concerned, and bask in the glow of the steady desert sun. With the power of the TomCar, which seats four passengers, you can drive deep into the legendary desert and see some amazing vistas. Now, how quickly do you think it would take to see all the desert has to offer? See More of the Desert Faster Than a Jeep Tour! Since our ATV rentals do not have the confines and bang-factors of a Jeep, you can get to your destinations faster. This means you get to see even more of the desert than you would in a Jeep Tour. What fun is there in sitting in the back of a Jeep while coasting along towards the end of the road? None! Imagine how it feels to see the true desert landscape slithering under the TomCar at twice the speed. 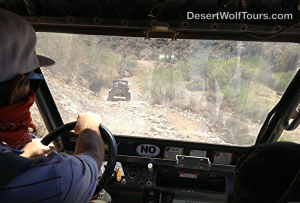 In fact, Desert Wolf Tours covers twice the distance, if not more, of a typical Jeep tour. Now, you may be asking what happens if it rains? Well, we have a solution: we are going anyway! Our desert tours depart regardless of the weather, so you should wear something that can wet. Wear something that will get dirty. Wear something that will always carry the memory of a real desert journey. Desert Wolf Tours Offers an Evening ATV Tour! Some touring companies only want to go out during a set time in the morning or afternoon, but we understand the magic of a twilight desert tour. Each evening in the summer, an army of TomCars swarms into the desert, and your dreams of seeing a different desert view come true. Have you ever thought of what spending a night in the middle of nowhere would look like? It’s not hard to imagine when you are heading out to uncover desert gems after dinner. With all these great reasons to try out ATV tours, why would you settle for less? Let us show you why a TomCar atv tour, not a Jeep Tour, is one of the best things to do in Scottsdale and Phoenix.